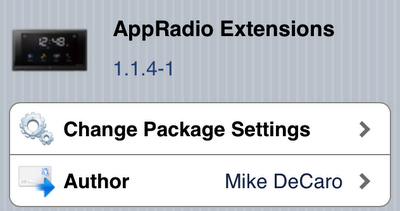 The jailbreak tweak, AppRadio Extensions, has been updated to version 1.1.4-1 today. The latest version by developer Mike DeCaro has a couple of enhancements and bug fixes. Here's full details of what's new in the update. - Added a home button to the CarMediaPlayer app. - Fixed home button issues in other apps. AppRadio Extensions works with the first generation AppRadio running v2.45 with an iPhone 4 or 4S running iOS 5.0.0 or 5.0.1. An untethered jailbreak isn't available for the latest iOS version 5.1. 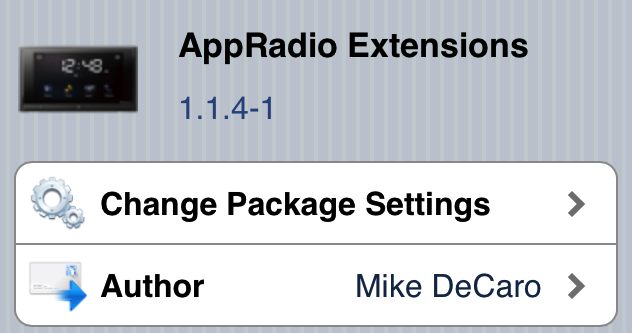 The Extensions are not known to work in full functionality with AppRadio 2. The 'disable launch alert' function, for example, doesn't work for me. If you have a jailbroken iPhone 4/4S and an AppRadio, go ahead and the AppRadio Extensions version 1.1.4-1 today from the Cydia Store.